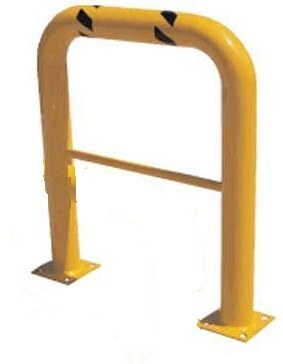 42 x 36 inch Hi-Profile Machine Pipe Guards provide protection for expensive machinery, rack systems and personnel. Models employ a double welded 1/4” x 8” x 8” steel base plate with four 7/8” x 1-1/4” slotted holes for secure mounting. Anchoring hardware is NOT provided. Manufactured from hefty 4-1/2” diameter x 11 gauge wall tubing. Finished in a high visibility yellow powder coat and shipped economically as freight class 50.